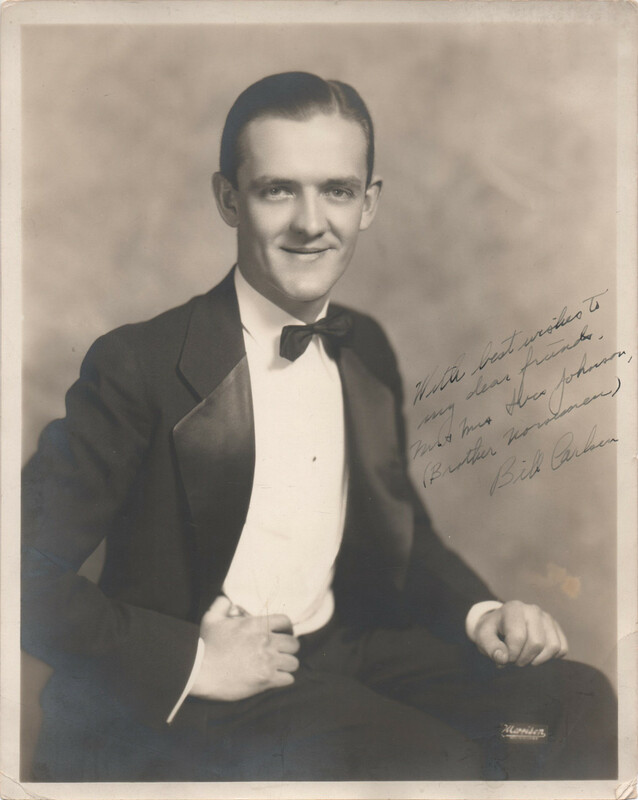 An autographed photo of bandleader Bill Carlsen, dating to the late 1920s or early ’30s. One of the best ways to experience the “real” jazz of the 1920s and 1930s is to seek out the oftentimes scarce records by the so-called “territory bands”, that being bands that traveled around various regions, usually by bus, gigging at dance halls, hotel ballrooms, and the occasional radio station. I think it’s safe to assume that those bands played what the regular folks were interested in hearing. This disc comes from a fine Midwestern territory band that had the distinction of playing at Milwaukee’s Wisconsin Roof Garden, an open-air ballroom perched atop the Carpenter Building at 700 North 6th Street, owned and operated by George J. Devine, who lent his name to the band for many of their records. The band, led by saxophone player and Kansas-native Bill Carlsen, was a hot one, playing in a style that we today might call “dixieland jazz” (at that time, of course, it was just “jazz”), with that hot and raucous sound common to Midwestern jazz bands. 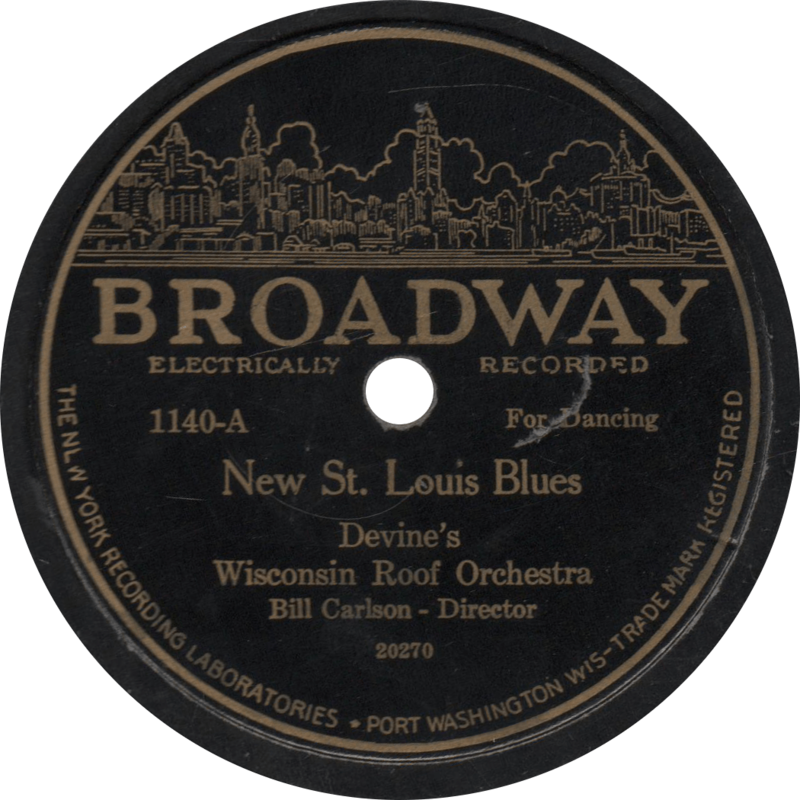 Broadway 1140 was recorded in December of 1927 at Paramount’s Chicago studio by Devine’s Wisconsin Roof Orchestra, directed by Bill Carlsen (spelled Carlson on the label). The band includes Dip Happe and Alec Alexander on trumpets, Ole Turner on trombone, Paul Peregrine, Harry Bortner and Bill Carlsen on reeds, Lee Simmons on piano, Ralph West on banjo, Chet Harding on tuba and Harry Pierce at the drums. This record was also issued as Paramount 12599. First, the band plays a hot and stomping novelty rendition of the “New St. Louis Blues”, which, as it turns out, is actually the same old St. Louis Blues as always. My speculation is that bands like this one titled it “new” to entice buyers that likely already owned a copy of the “old” St. Louis Blues. New St. Louis Blues, recorded December 1927 by Devine’s Wisconsin Roof Orchestra. Next up, they play what is surely one of the all-time best versions of that classic (or as Satchmo might have put it, “one of the good old good ones”), “Tiger Rag”.—one of my own favorites, at least This pressing is the first of two extant takes of this side. 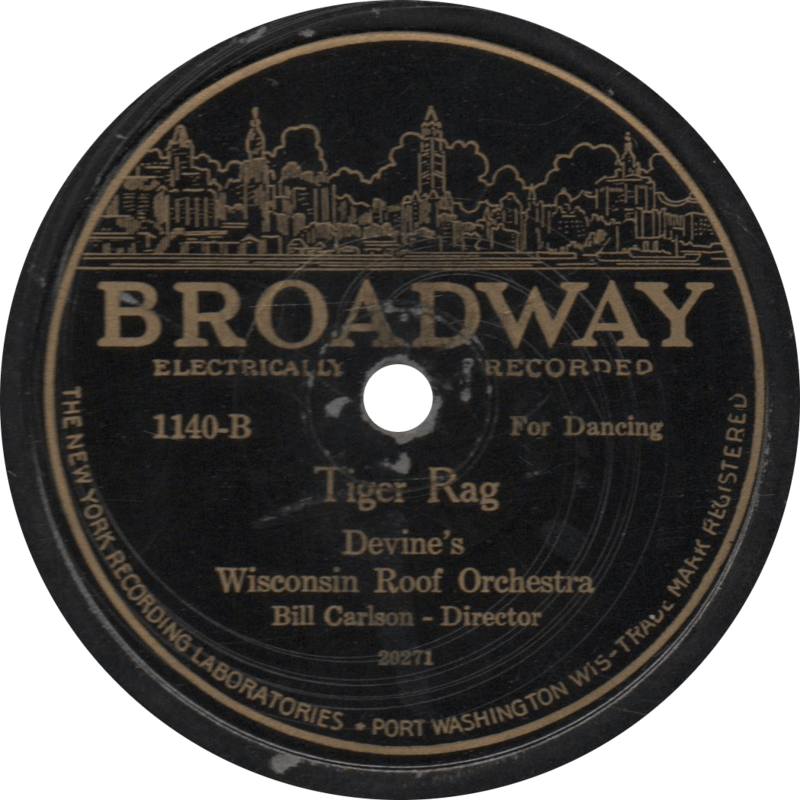 Tiger Rag, recorded December 1927 by Devine’s Wisconsin Roof Orchestra. Updated with improved audio on June 5, 2018. This entry was posted in Records and tagged 1920s, 1927, Alec Alexander, Bill Carlsen, Broadway, Chet Harding, Chicago, Dip Happe, Harry Bortner, Harry Pierce, Jazz, Lee Simmons, NYRL, Ole Turner, Paul Peregrine, Ralph West, Territory Band by R. Connor Montgomery. Bookmark the permalink.